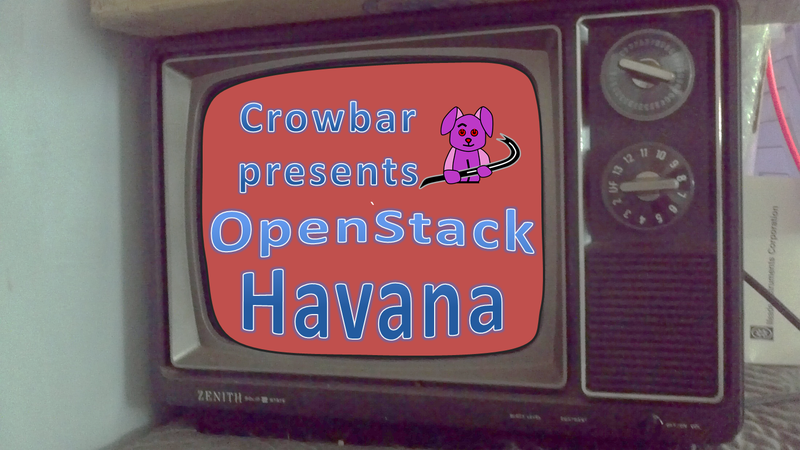 Looking to Leverage OpenStack Havana? Crowbar delivers 3xL! The Crowbar community has a tradition of “day zero ops” community support for the latest OpenStack release at the summit using our pull-from-source capability. This release we’ve really gone the extra mile by doing it one THREE Linux distros (Ubuntu, RHEL & SLES) in parallel with a significant number of projects and new capabilities included. I’m especially excited about Crowbar implementation of Havana Docker support which required advanced configuration with Nova and Glance. The community also added Heat and Celiometer in the last release cycle plus High Availability (“Titanium”) deployment work is in active development. Did I mention that Crowbar is rocking OpenStack deployments? No, because it’s redundant to mention that. We’ll upload ISOs of this work for easy access later in the week. While my team at Dell remains a significant contributor to this work, I’m proud to point out to SUSE Cloud leadership and contributions also (including the new Ceph barclamp & integration). Crowbar has become a true multi-party framework! My team at Dell has a significant presence at the OpenStack Summit in Hong Kong (details about activities including sponsored parties). Be sure to seek out my fellow OpenStack Board Member Joseph George, Dell OpenStack Product Manager Kamesh Pemmaraju and Enstratius/Dell Multi-Cloud Manager Founder George Reese. Note: The work referenced in this post is about Crowbar v1. We’ve also reached critical milestones with Crowbar v2 and will begin implementing Havana on that platform shortly. This entry was posted in Crowbar, Dell, Joseph George, Kamesh Pemmaraju, OpenStack, OpenStack Design Summit, Suse and tagged Ceph, Crowbar, Docker, Havana, OpenStack, release by Rob H. Bookmark the permalink.